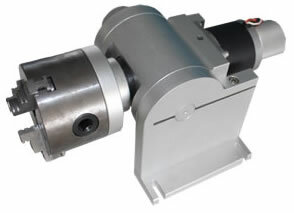 Step motor is used. Our marking software LMX-1A can be used to drive the stage. Model number is R70. The largest diameter of the workpiece that can be installed into the 3-jaw chuck is 70mm. If the workpiece is long, one end of the work piece is fixed by 3 jaws and another end is placed on a V-shape support with rollers. Another model is R100 and its largest diameter of the workpiece that can be installed into the 3-jaw chuck is 100mm. It is used to mark on the cylinder’s surface. Please click here to download and watch rotary marking process. Linear bearing guide, ball screw driving and step motor (or servo motor) are used in STA series motorised linear stages. A XY stage consists of two linear stages. For example, a XY stage with a travel of 300x500mm may consist of a STA300 and a STA500. Remark: 1. Other table sizes available upon request. CNC2000 software can be used to drive the above stages. If the above stages are used to expand the laser marking field by moving the workpieces to be marked, you can use our marking software LMX or LMC to control a laser marking head and a XY table together.